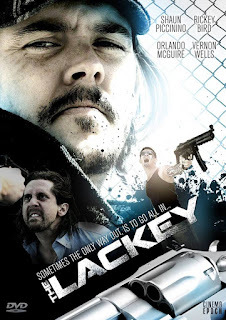 The Lackey starts with a Reservoir Dogs feel, pours in some Guy Ritchie styled narration, mixes it all with a splash of Mixed Martial Arts, and then serves it to you with such a well polished rawness that you quickly forget that you are watching a “low budget” Indie Film. The look of the film is quite unique and hard to explain, it’s “grainy” without looking like your watching a twelve year old 35mm print in a dollar theater. This multiple award winning film grabs you by the collar and drags you straight down into the street where the action takes place. The writing is spot on with a mix of wit, heart, and believability. The fight scenes feel natural and are choreographed in such a manner as to feel completely spontaneous. Kudos to Shaun Paul Piccinino and Steve Pisa for not only writing this visually striking film, but also for coordinating the stunts, which include possibly the best fight scene that takes place around a billiards table you will likely never find a comparison to. The actors all play their roles true and with respect to the genre. The lovely Lauren Parkinson (“Phase Two”, “In Mysterious Ways”) plays Lola, Jude’s junky ex-girlfriend, who can still tug the heartstrings of our hero like a marionette handler while she spirals out of control. Orlando McGuire (“The Bloodletting”, “Deadliest Warrior”) steps right into the spotlight as Suga Henare, the always eager sidekick to the cagey Sonny Fingers, played by Rickey Bird Jr. (“The Deadlines”, “Phase Two”). Two of the most unforgettable characters of the film are Big Leo, played by D.T. Carney (“John Dies at the End”, “The Curse”) and Guy A. Grundy (“Deadliest Warrior”, “Acts of Violence”) as Grundy. There are no shortcomings in the acting department on this one, From Shaun Paul Piccinino (“Deadliest Warrior”, “Jinn”) who plays the infamous Jude St. Clere to Vernon Wells (“Mad Max 2: The Road Warrior”, “Weird Science”) as Mr. Dechlan. There are a multitude of mastermind actors in supporting roles as well that bring the whole film to life and complete what just might be one of the best action films to hit the Indie screen in quite some time. So what is the greatest aspect of The Lackey? One word, Cinematography. Ian McAleece and Jason Sanders are nothing short of genius in the way they show you the darker side of any major city. They put you in places you would never see on a tourist brochure and makes sure that you feel it gather grit under your fingernails while you witness the story unfold. This action film lives up to the action billing as well. Just when you think you can’t possibly handle any more excitement, the pace slows for a moment so that you can catch your breath, take in the moonlit cityscape, and then plunges you right back in. Like a truly feared roller coaster ride, you don’t know whether to raise your arms and cheer or just white knuckle the arms of your couch, and try not to get knocked out of your seat! Rickey Bird Jr steals the show with his performance as “Sonny Fingers.” Some really hilarious moments between Sonny and Suga too! Really well written review, Terry! Can’t wait to read your take on more films! Nice Review! I agree, Rickey Bird was amazing in the film. His best performance yet!